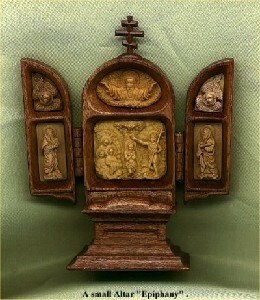 Saint Georg - microscopic Icon. Born in 1967 in Leningrad, Russia. Have not any art education. I LIVED IN ART, BUT BEGGAR KILL MY WISHES MAKE ANY EXPERIENCES IN ART. I DO NOT CREATOR OF MINIATURE SCULPTURES NOW - ONLY ORDINARY MAN.